Figure skating poses, spins, and moves are some of the best parts of the sport. You watch in awe as skaters leap through the air or glide effortlessly on the ice wondering what exactly it is they are doing and how they are able to make it look so beautiful. As a new figure skater, you might seem overwhelmed by the thought of landing a double axel or you’ve never even heard of a camel spin. We’ve put together a guide explaining figure skating poses and skills and at what level you will learn them. As you progress in figure skating, in order to compete in a certain level a skater must pass a test. Each level has different poses, moves, and skills associated with it. Typically, an athlete will start with Moves in the Field tests as it is a prerequisite for other tests. Each level builds off of the one before it, and you may not progress to a higher level without first passing the level below it. Moves in the Field tests are important because they are often the staple skills a skater must have in order to be successful. 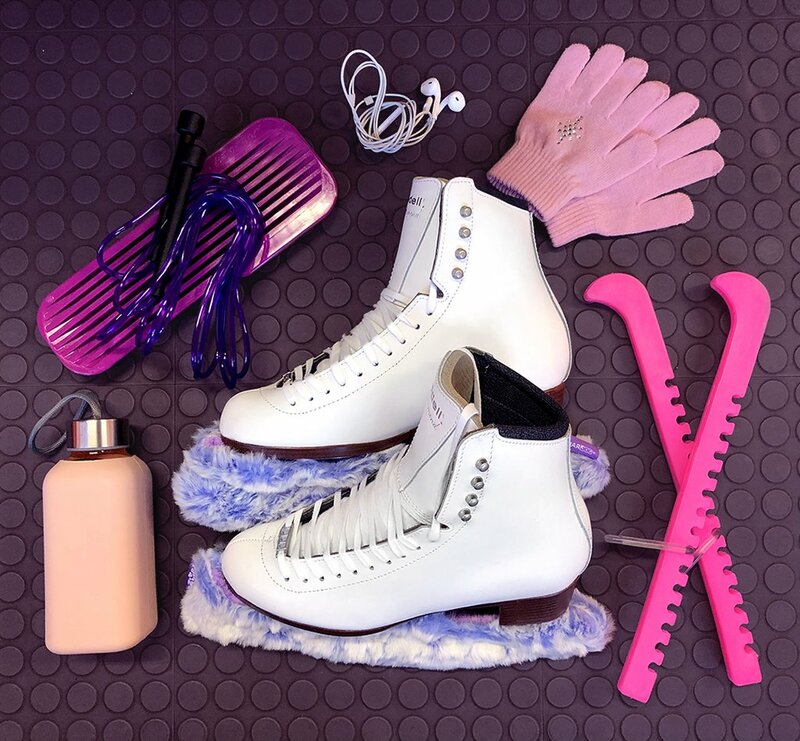 For a figure skater, in order to skate at a certain level, you must be able to perform certain skills. Each level will test the skater on whether or not they have the ability to move up or need to continue to work on those moves and poses. Beginner skills are often tested in the first few levels of skating. Here are a few beginner skills as defined by U.S. Figure Skating. Stroking – Stroking is the beginning building block of skills for extension and balance. It helps develops core body strength needed for advanced moves. Edging – Edging is when a skater uses the edges of the blade to move or gain speed in a jump. Swizzle – A method of two-foot progression, either forward or backward, by an in-and-out movement of the feet on inside edges. Waltz Eight – The Waltz eight is a move that is done in a figure eight pattern. It teaches the proper check positions for jump entries. Waltz jump – Taken off of the forward outside edge, the skater makes a half revolution in the air and lands on his/her back outside edge on the opposite foot. Flip jump – A toe-pick-assisted jump taken off from the back inside edge of one foot and landed on the back outside edge of the opposite foot. Loop jump – An edge jump, taken off from a back outside edge and landed on the same back outside edge. Lutz jump – A toe-pick-assisted jump taken off from a back outside edge and landed on the back outside edge of the opposite foot. The skater glides backward on a wide curve, taps his toe pick into the ice, and rotates in the opposite direction of the curve. Axel jump – On an axel jump, the skater takes off banking on a forward outside edge. After jumping from that forward edge, the skater makes one full revolution and a half revolution in the air and lands on the skate on a back outside edge. Camel spin – A spin which is done on one leg with the non-skating leg, or free leg, extended backward with knee higher than hip level. The body remains in this “spiral” position while spinning. You won’t be able to show off elegant poses or land difficult jumps if you don’t have the proper skates. Get a custom-fit with Riedell. Our talented master craftsmen will design and build your custom ice skates to the exact specifications and features of your unique feet. With customizations including the color, leather temper, firmness, and more, you’ll be on your way to your dream skate in no time! Riedell Skates - Ice is feeling excited. Is there anyone lucky who’s going? ?